SAMHSA’s National Registry of Evidence Based Programs and Practices (NREPP) reviewed the ALC before shuttering their website. NREPP give it a 3.3 (out of 4) quality of research rating and a 3.5 readiness for dissemination rating. You can read NREPP’s original 2012 review here. In 2017 NREPP re-reviewed the ALC and wrote “This program was rated effective for reducing alcohol use and disorders; and for improving knowledge, attitudes, and beliefs about substance use. You can read NREPP’s 2017 review finding the Alcohol Literacy Challenge™ effective here. Not only is the ALC proven effective at reducing underage and binge drinking, it’s cost effective – taking far less time and, after the initial training, costing less per student than any other classroom youth alcohol prevention program. Based on 40 years of research reported in nearly 1,000 published studies, the Alcohol Literacy Challenge™ provides prevention lessons students love. 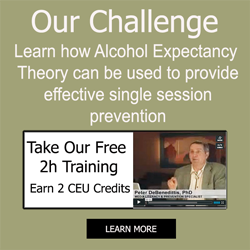 Using cutting edge brain science & media literacy education about alcohol marketing and social media, the ALC is the 1st classroom-based alcohol prevention program provide to reduce underage and binge drinking in a single 50-90 minute lesson. A media literacy education firm specializing in substance abuse prevention. Over the next 5 years he writes 11 volumes of youth prevention curriculum and speaks to just under a quarter million students. His curricula became widely used across America. Showing that challenging alcohol expectancies (i.e. children’s beliefs about the effects of drinking) can be done in a single classroom session. Nearly 1,000 studies since the 1960s have shown that when drinking beliefs change, behavior follows and students drink less. SAMHSA’s National Registry of Evidence Based Programs & Practices publishes its review. NREPP gave the ALC a 3.3 (out of 4) point rating for the Quality of Research validating it and a 3.5 rating for its Readiness for Dissemination. Few NREPP reviews give research quality ratings above the mid twos. Have a 3.3 rating gives high confidence when we say: The Alcohol Literacy Challenge™ is proven to reduce underage & binge drinking in a single session. Dr. DeBenedittis releases the 5th rewrite of the original curriculum. Drawing from his continuous focus groups testing on ways to improve the ALC, Dr. DeBenedittis releases the 5th rewrite of the original curriculum. It features a more visually interesting style and addresses social media’s role in forming youth’s beliefs about alcohol. It also uses more movies and custom animations to convey key teaching points. The result is a more engaging experience for students with presenter better fidelity. This blog contains research, information and educational materials about how media literacy is used for science-based prevention. "The ALC is engaging, its efficient and effective…try it out"
"I nicknamed the program “Too smart to be fooled” because that is what it teaches 5th Graders to be…"
"A super fun curriculum which we are going to offer to 5th Graders through to 12th Grade and also show their Parents. " Copyright © 2018 Alcohol Literacy Challenge. All Rights Reserved.